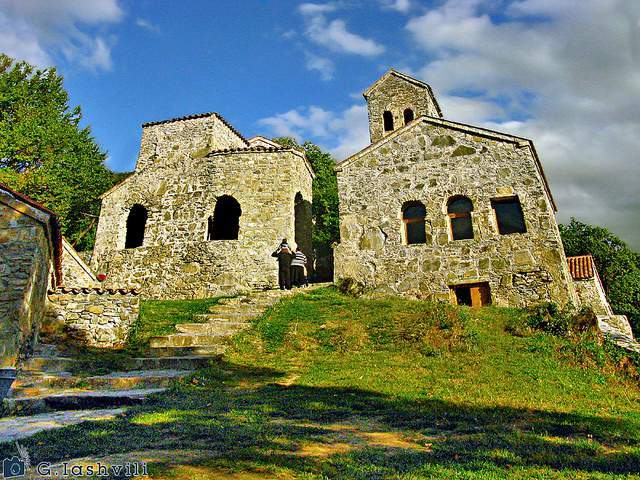 Nekresi Monastery is located close to the city of Kvareli. Standing on top of a high hill, it dominates Alazani Valley and the whole complex is easily noticeable from a distance. A rather large city had existed at the foot of a hill at the outset of the new age. Not much is known in its regard yet. Excavations are still in progress, and remains of several important ancient buildings – of an early Christian basilica and pagan temple or palace were revealed, but they have not yet been dated finally. 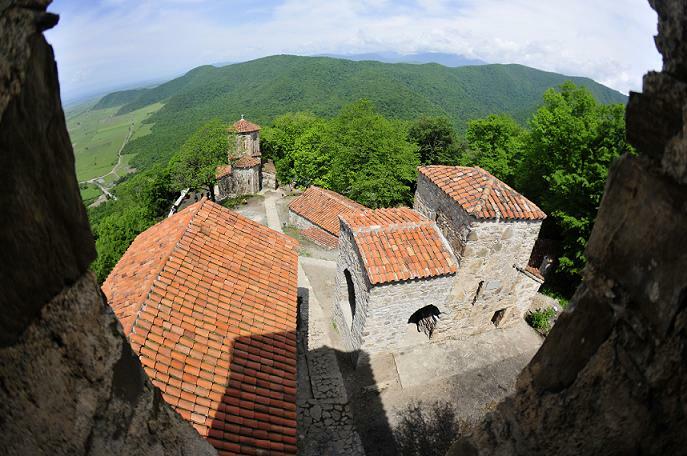 From the very date of its foundation till the end of XVIII c Nekresi Monastery had been the center of the episcopate. The most outstanding figure of local clergy was father Abybos of VI c AD, one of the 13 Assyrian Fathers, canonized for his martyrdom for Christianity. He propagated against the official confession of the Sassanid Persia – Worship of Fire, cultivated by Persians, who dominated western Georgia by those times. Another well known spiritual leader was Father Ambrosi Nekreseli, highly educated man of X VIII c and skillful orator, whose preachers are outspending samples of Georgian homiletics. Several buildings of different epochs are preserved in Nekresi Monastery , each heaving particular significance. The earliest of them, apparently constructed in IV c AD or at the beginning of V c the latest – is a small, rough stonework church that stands on the upper section of the complex. Originally the church consisted of three parts – high and narrow middle section with the apse of the same configuration and wider and lower extreme sections externally opened through three – sided horseshoe-shaped vaults. External outline of this uncommon construction (with an undercroft arranged beneath) resembles a basilica, although its structure is totally different. That kind of situation could only have existed on the earliest stages of spread of Christianity, when the basics of liturgy and church architecture were at their initial stage of development. Mother of God temple constructed at the turn of VI-VII cc. stands westward of this small church. It is a three-church basilica – type construction is built of cobblestone and rubble stone mixture. This main church of the monastery has got a central hall, an apse, eastern rooms detached to the apse and elongated rooms grouped on south and north of the central hall and connected by western doorway. Central hall is the most distinguished of all other rooms because of its height, width and much better illumination. Exterior of its western wall is adorned—a huge cross is outlined within a flat niche by means of laying technique. In XVI c. during the reign of King Leon and according to his orders the temple was adorned with wall painting. The sovereign and his spouse are depicted on the southern wall of the interior. Currently the wall painting is in rather bad repair. The third significant church of the monastery, besides several small chapels with negligible architectural value, is erected slightly lower, on the place where the slope turns into a plan. This is a domed construction with square configuration and extended apse. The ambulatory opened by means of arches encircles the building from three sides. Western part of the dome rests upon tromps, while its eastern section is supported by horizontally arranged stones. The church with highly proportionate vertical main space and narrow and shallow niches used as decoration pattern of the dome, boldly contrasts horizontally stretched gallery. Supposedly this church should be of IX c. as are several other structures of the monastery (a refectory for instance, that stands close to the domed church) the most outstanding of which is a two-storied palace built next to the main church at the very edge of the slope. A grand hall on the first floor almost totally open by the huge horseshoe-shaped arches is the most impressive part of this building, heaving some resemblance with German medieval palaces. This building is dated to IX-X cc. In later times, most likely in XVII c. a tall observation tower was erected in its middle.